THESE ARE the new diners of Brick Lane, who happily sit on a kerb to eat from Polystyrene receptacles. The Curry Mile, as the area and its large number of Bengali restaurants is sometimes known, is still one of London’s tourist draws. But increasingly it is a place of takeaways rather than sitdown dining. Local businesses are not happy. 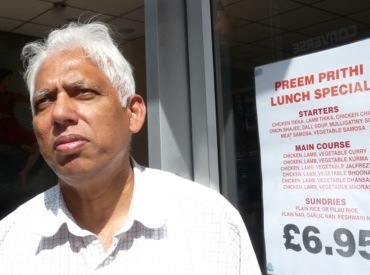 Azmal Hussain, of Brick Lane Restaurateurs’ Association, told Loving Dalston he believed that gutter dining was bad for the image of Brick Lane. Interviewed at Preem and Prithi, his restaurant adjacent to Princelet Street, he said: “Young people, who seem to be students and tourists, buy takeaway food, then sit in the street to eat it. “There is nowhere for them to wash their hands, let alone go to the toilet, and afterwards people can be seen peeing in the street. A spokesman for Tower Hamlets council said: “We have not received reports or complaints about this activity before you asked us about it. * Preem and Prithi is at 124-126, Brick Lane E1 6SE (0207 247 0397). * None of the people in the picture above was seen to behave in an unhygienic manner. Has the restaurant owner tried to enforce no parking or loading on a double yellow line? Diners are obstructing the road and in effect (loading) themselves with food!